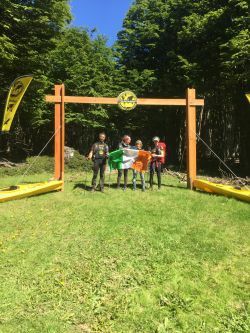 With the first three teams safely across the finish line and tucked into their respective hostels in Punta Arenas, another team was set to cross the finish line and in so doing, make PER history; DAR Dingle. SleepMonsters had been out on the course yesterday and seen the team as they’d finished the kayak stage at 13:00 and transitioned onto the last bike stage of this epic race. Apparently the team hadn’t known about the enforced dark zone for all teams, and coming off the kayaking on the Magellan Strait, Noel said that they were not too pleased to have had to stop racing and wait until the dark zone lifted at 06:00. 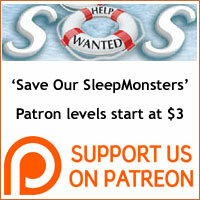 He said that they’d expected to get straight on to the kayaks instead of sleeping for four hours. They may not have known it at the time, but they were the only ones of the lead teams to have been able to do this section; the previous three teams had missed out due to the high winds. As she was peeling off the unwieldy drysuit, Caz told me that they decided to re-name the race the “Patagonian Expedition Retreat” and having piqued my interest with that tantalizing snippet, promised to elaborate on the finish line. Linda was silent throughout the transition and Caz had a what sounded like a deep chest cough. Noel confirmed that they “had a few niggles after the last trek but that was to be expected.” It looked like those “niggles” were mainly blisters and Noel’s Achilles tendon. Riding with the race director, we transferred their bike boxes to CP-07, driving along a rough dirt logging road. It was a mad dash as it appeared that DAR Dingle was completing this stage faster than any of the previous three teams had. Such was their speed that the RD stopped and asked a crew working on the road if they’d seen the team passing through; he was worried that they might have been lost. When the crew confirmed that the team was on the correct road, the RD put the pedal to the metal and roared up the road, bike boxes bouncing in the back of the truck. There was a moment of tension when we came across heavy utility trucks carrying out works on the narrow dirt road. The RD quickly negotiated passage and the lumbering trucks were moved to let us pass; typical AR moment in which anything can happen and the unexpected is always just around the bend. DAR Dingle arrived at CP-07 at 17:10, completing the last 32kms of mountain biking. As she was dismantling her bike and packing it into the box, Linda looked relieved, saying that one of the ways she’d been keeping track of time was by the number of times she’d had to pack and unpack her bike box and she said she was happy that this was the last time. Noel asked the race director for information on how far the Brazilian team Terra de Gigantes Selva was behind. He knew that they were chasing hard and the dark zone had given them a potential boost. There could be no nav errors on the last trek or their coveted fourth place position would slip through their fingers. Selva had been applying the pressure and Noel was acutely aware of the threat they posed. While the ladies were changing in the tent, preparing for the last trekking section on battle weary feet, Noel asked about news from home. When I told him that judging by the activity of SleepMonsters, one would think that they were the only team in the race, Ailise roared, “But we ARE the only team!” It was good to see that the joyous banter of this team had survived the harsh lashing of The Last Wild Race. However, much of their gear wasn’t as fortunate as their banter. For example the thorns of the notorious Calafate bush had ripped their waterproof trousers to shreds: Ailise joked that they were putting on what was left of their waterproofs. Ailise’s joking comment reflected what all teams had expressed throughout the race; that the course continually delivered surprise terrain twists. As they headed out to the last trek that would lead them to the finish line, they were accompanied for awhile by Sam, a race volunteer from the US who took pictures of the team while they plodded to completion of their Patagonian quest. On Wednesday, November 28th, DAR Dingle crossed the finish line at 11:16. In that moment, they entered the history of PER, becoming the only team composed of three women and one man, to have had completed this race; the word legendary is not too strong. Linda’s friend from Ireland, Keith Symes, had been traveling though the Torres del Paine National Park and he’d arrived back in Punta Arenas just in time to live stream their arrival. The weather was the best it’s been since the race began and the fabulous four relaxed in the grass under the wooden finish line structure. Race volunteers ferried beers and pizza out from the finish line tent to the team as they peeled off encrusted socks and inspected their feet. Caz finally elaborated on why they’d discussed throughout the race re-namimg the event the “Patagonian Expedition Retreat.” She said that it had all of the trappings of a luxury spa; guided tours, skin treatments like exfoliation, salt baths, etc. She added with a laugh that the only down side was that the pedicurist was on vacation. Fine DAR Dingle banter to the very end. Hearing this detailed spa description, Noel laughed and said that it was good thing that he’d had the maps to keep him company and talk to. The team spoke of sleeping four in a tight tent, top to tail. Caz joked about cuddling feet and that she might be lost without a pair of race fragrant feet to cuddle as a security blanket tonight. A more reflective mood came over Noel as he mused that PER is “such a personalized race.” He organizes a race in Ireland and he commented on what a massive logistical undertaking the race had been from the point of view of the organizers, with continual ferrying of bike boxes and gear from checkpoint to checkpoint, tailored to the advancement of each team. He won’t have been aware of the nitty gritty details but behind the scenes, two of the four organization vehicules had broken down at some point, and the RD had played a fine game of chess to move everything smoothly across the vast Patagonian distances. The team was incredulous when told that they’d made PER history as the only team to have ever finished with three women. Noel looked jokingly miffed and said that next time they’d be coming out as a four woman squad. They closed by saying that one of the best pre-race preparations they’d done was watching all of the videos they could find of previous editions to prepare themselves for the brutal conditions they would be facing; photos do not paint an accurate enough picture. Although they were laughing to the very end, it was abundantly clear at this point that this race had been a huge investment in terms of money, training, time off work and away from loved ones, etc. DAR Dingles’s fourth place podium was a just recompense for a perfectly excecuted race strategy. It was time for the team to head to their hostel and a longed for shower.